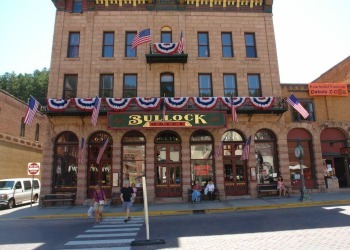 The Bullock Hotel is a Deadwood Treasure. Experience the history and elegance of Deadwood's first hotel. All are unique and have been painstakingly restored to the original details that Seth Bullock first envisioned. This hotel have the perfect accommodations for leisure guests or family weekend getaways! The hotel was founded by Seth Bullock, Deadwood's first sheriff, and he has never left. His ghost walks the halls. Bullock was sheriff in the 1870s and died here in 1919 but was never really laid to rest. He was the sheriff "whose gaze could stop fights." Since then, nearly three dozen people have seen his ghost. These include guests, employees, and managers of the hotel. Seth Bullock and Sol Star saw opportunities in Deadwood other than gold when they moved their hardware store from Helena, Montana in 1876. When the devastating fire of 1879 destroyed their building, they rebuilt with a two-story wood-frame store that included a fire-proof warehouse in back. Unfortunately, the business burned again in 1894, leaving nothing but the brick warehouse standing at the rear of the building. 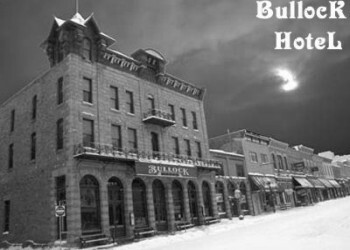 Changing tactics, Bullock and Star then decided to build Deadwood's finest hotel over the original store and warehouse. Hauling in native pink and white sandstone from Andrew's Quarry in Boulder Canyon, the work of building the Italianate style hotel began. When it was complete it boasted a restaurant that could seat 100 people and offered such delicacies as pheasant and lobster. The large lobby featured red velvet carpeting, brass chandeliers, oak trim and a Steinway grand piano. Upstairs, the 63 rooms were furnished with oak dressers and brass beds, each floor had a bathroom, and a library and parlor were located off the balcony. The grand opening was held in April, 1896. In no time at all, the hotel was the most sought after luxury hotel of its time. In 1900 a small building that adjoined the hotel on the South was obtained by Bullock which served as the Gentlemen's Bar. The pair sold the hotel to George Ayres in 1904, who operated a hardware store on the main floor, and continued to operate the Hotel as the Hoizner until 1919. Later it was called the Ayres Hotel. In the 1990's, the hotel was completely restored, including the massive staircase and skylights, and continues to greet guests today. Thanks to Legends of America for this information.